Philomena Francis was born in 1969 in London to parents of Caribbean origin. She studied Fine Art Theory and Practice at Chelsea College of Art and Design and graduated in 2006 with a first class honours degree. Philomena came late to studying Fine Art. Her first degree was in social studies and social work, from which she graduated in 1991. In 1994 she retrained as an Art Therapist and combined her two passions: creating art and working with people. Six years later, Philomena completed an MA in Art Therapy. Throughout this period Philomena continued to make art work, but decided to train as an artist in 2001 by undertaking a five-year BA (hons) degree in Fine Art at Chelsea College of Art and Design. Her art work explores the fluidity of identity, the complexity of the inner experience (sensory and internalised) and the outer appearance (the body and the context). Growing up as a first generation Black British child to Jamaican migrants and the psychoanalytic thinking from her Art Therapy training are some of her primary influences. This exploration has led Philomena, in her more recent work, to explore the essence of black female identity and self image. Using references from the ‘black vernacular’, where brown sugar alludes to black female sexuality, Philomena created the ‘Brown Sugar Series’. This work was based on interviews with five black women about their bodies. After selecting three women for the art work, Philomena used a variety of unrefined brown sugar to create ‘sugar paintings’ of the women’s bodies in three wall hangings made of sack cloth and sugar cane. Her later work expanded on her interest in sugar substances with the introduction of black treacle for the creation of lines (as in drawing), drips and the context (or territory) in which the work is created. The choice of medium is an important part of the work: the rough canvas used for the wall hangings in the ‘Brown Sugar Series’ was reminiscent of the sacks used to transport sugar processed in small mills during Philomena’s father’s childhood in Jamaica. The sticky fluid nature of the black treacle is also reminiscent of the ‘liquid’ produced in the sugar refining process. These cultural references continue to intrigue her and black treacle has become the main medium through which she creates site specific installations. In 2003, Philomena showed in a group exhibition entitled ‘Neither fish nor flesh’ the Space Gallery ( London). ‘The Brown Sugar Series’ solo exhibition at the Castle ( Northampton, England) and Philomena was part of conceptual group exhibition ‘The Exchange’ at the Woburn Gallery ( London). 2006 her final show at Chelsea College of Art and Design in which she created a mixed-medium instillation using black treacle. Philomena continues to work with black treacle and was commissioned for the Institute of International Visual Arts (INIVA, London) first window project in 2007. Her work appeared in the Proximity & Distance installation for the Gulbenkian Foundation, Lisbon Portugal in 2008. 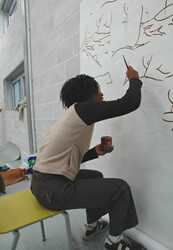 And she was also commissioned for City Gallery Leicester (2009). Philomena lives and works as an Artist and Art Therapist in London.